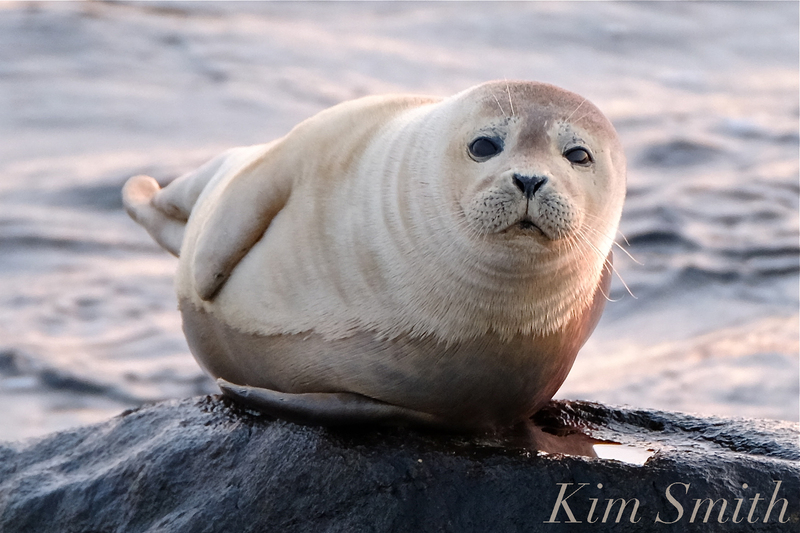 Are these two seals even the same species? The answer is yes, both are Atlantic Harbor Seals! 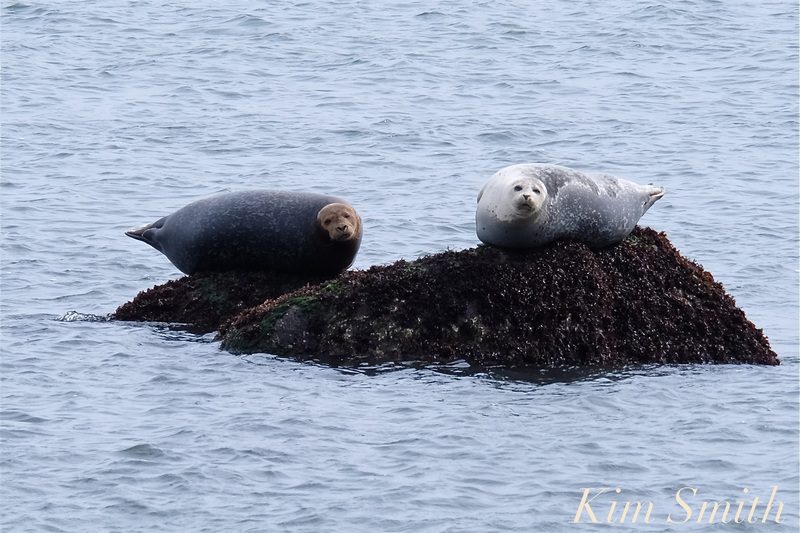 By far the most commonly seen seals found along the Cape Ann coastline are Harbor Seals (Phoca vitulina), also called Common Seals, and with multiple sightings, they have certainly been making their presence known this past week. 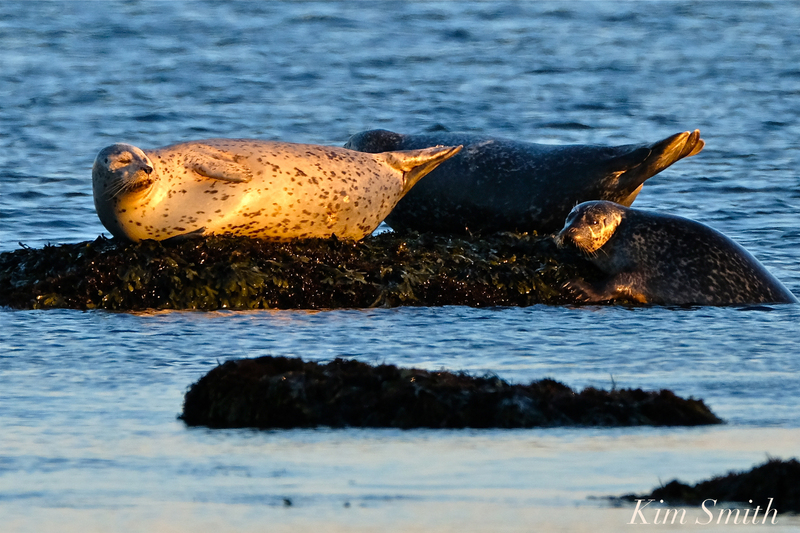 The coloring and spotted patterning of the Harbor Seal’s coat is highly variable, as you can see in the above photo, ranging from chocolate brown-black to palest silvery gray. 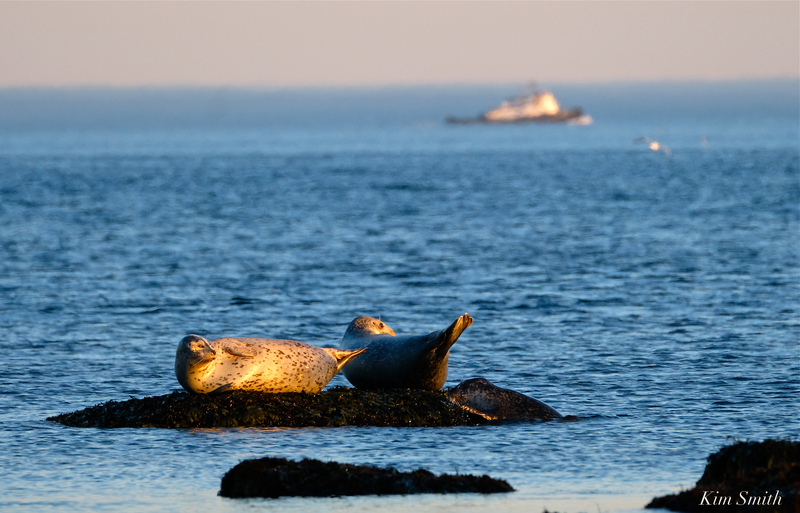 In recent years, Gray Seals have made an incredible comeback and are seen with much greater regularity in Cape Ann waters. And with their increasing numbers, the Great White Shark is also increasing in number, as Gray Seals are their preferred food. 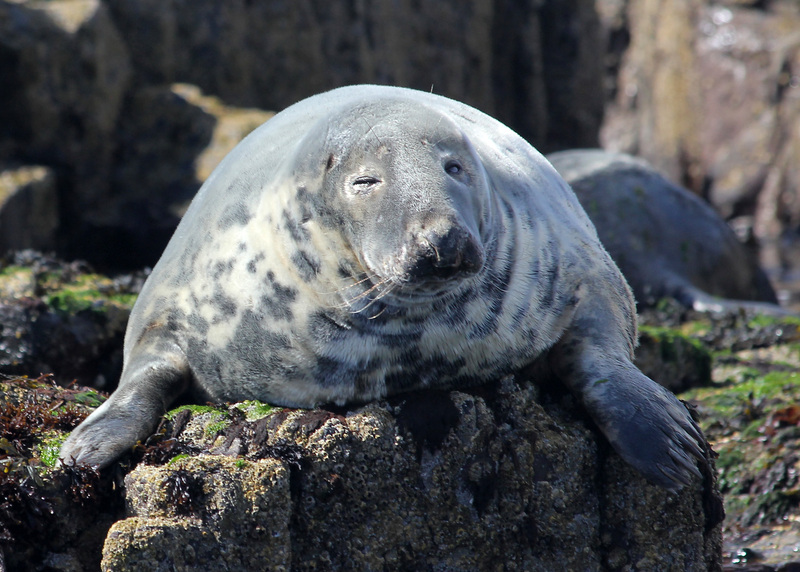 I don’t have a photo of Gray Seals, but found several on wiki commons media for the sake of comparing. 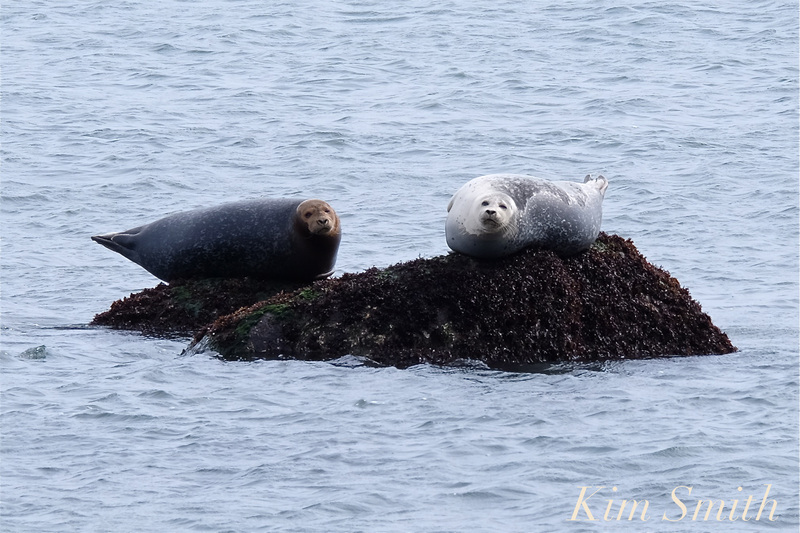 Notice the Harbor Seals small and concave shaped head. 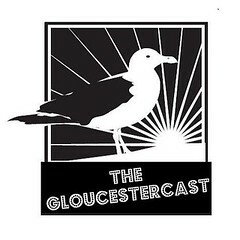 Harbor Seals have a head that looks a bit too small for its body, with a concave shape, whereas the Gary Seal’s head is more proportionate, with a long straight snout–no distinguishable brow. 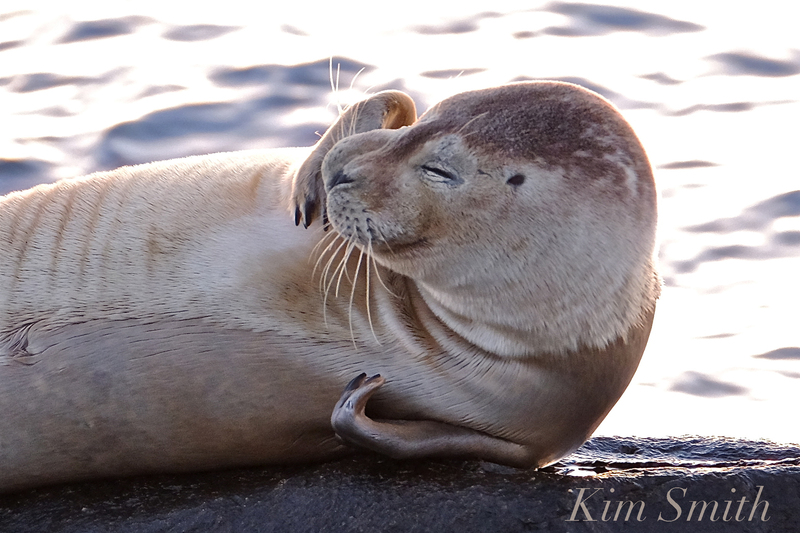 Harbor Seals nose nostrils are V-shaped; Gray Seals are shaped like a W.
Gray Seals are much larger at maturity: A full grown male Gray Seal weighs about 770 pounds, a full grown male Harbor Seal about 350 pounds, less than half the size of the Gray Seal. 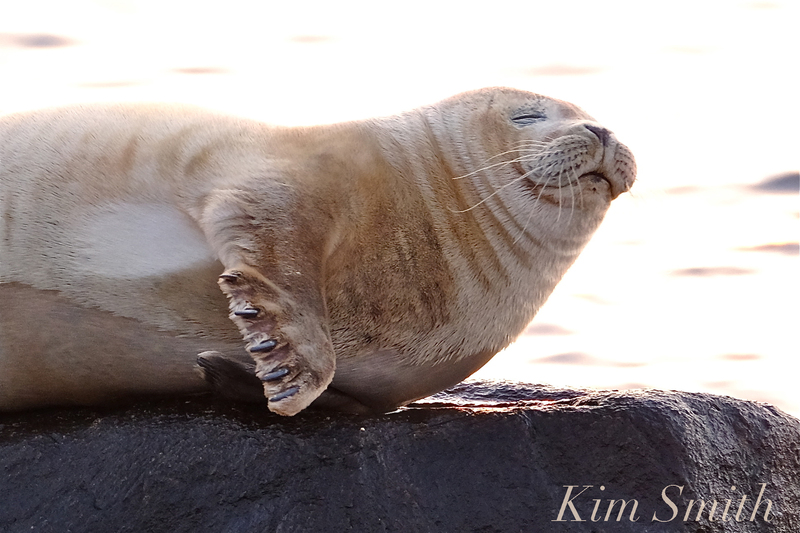 When hauled-out Harbor Seals adopt a funny banana shape- ‘head up, tail up’ posture. 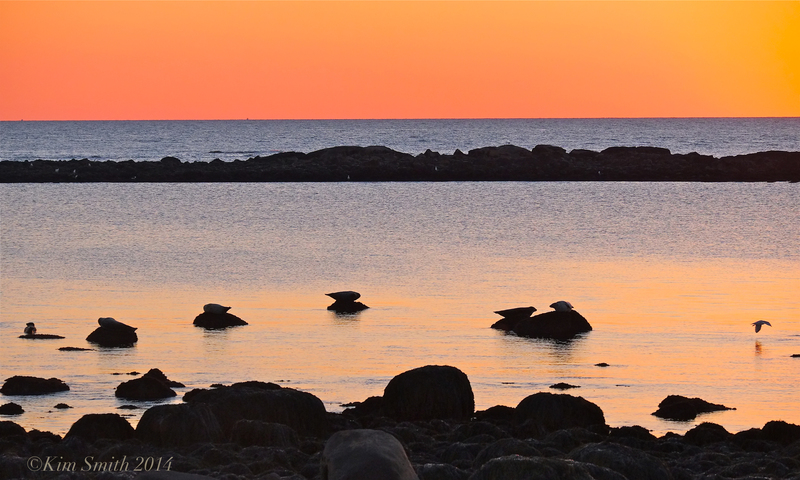 READ MORE HERE about the different species of seals found in Massachusetts from the Center of Coastal Studies. 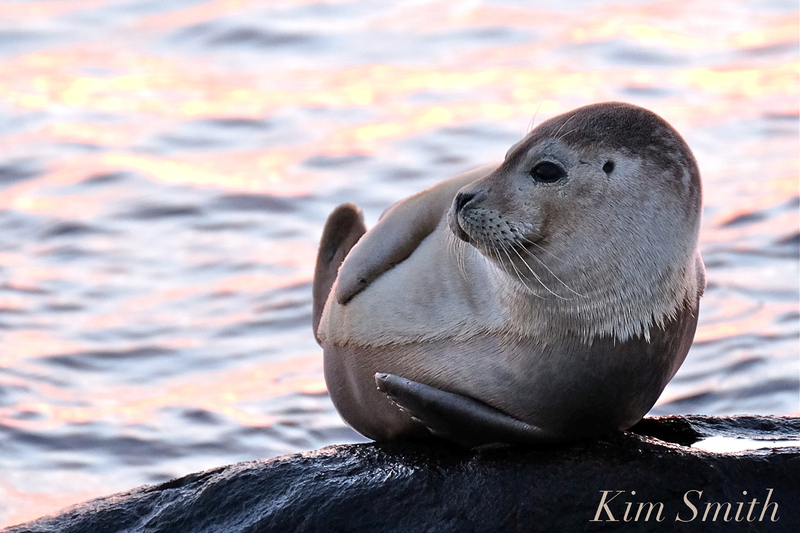 Harbor Seals are relatively small (1.5 meters, or 5 feet long), with a coat that varies somewhat with age, wetness and between individuals. Some pups are born with a light colored, lanugo coat (fetal fur that most mammals shed before birth). The lanugo coat is shed within a few weeks of birth. 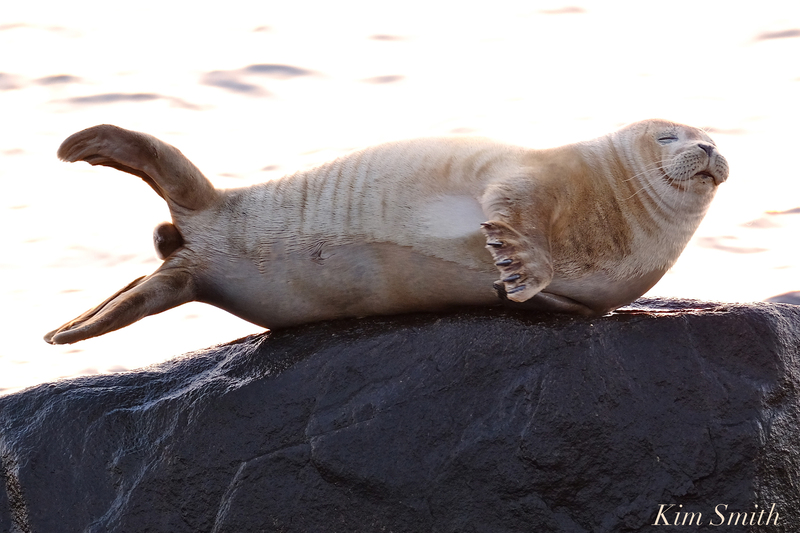 Most seals, though, are born with an adult coat that darkens with age. Females in this area usually give birth in late spring and early summer. 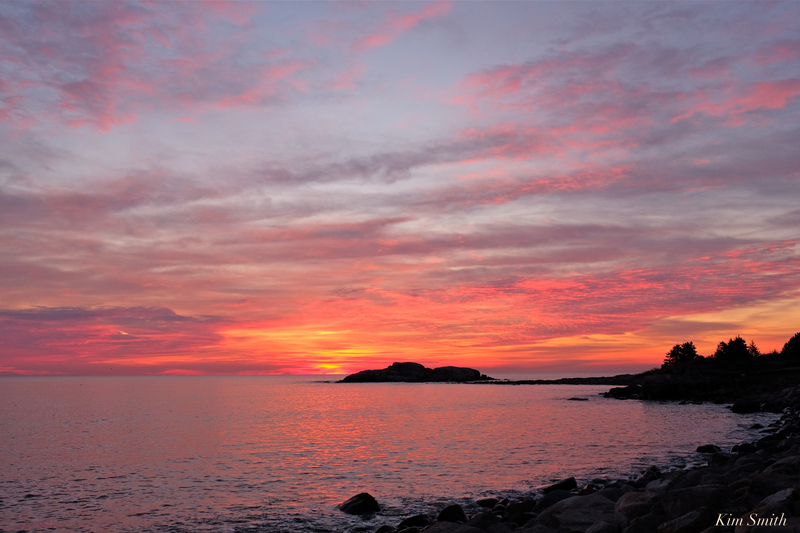 It is thought that females from Massachusetts migrate to quiet islands in New Hampshire and southern Maine to pup. 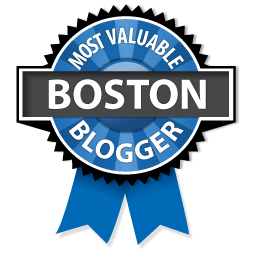 Historically, harbor seals pupped in Massachusetts, and there are increasing sightings of very small pups here in May and June. 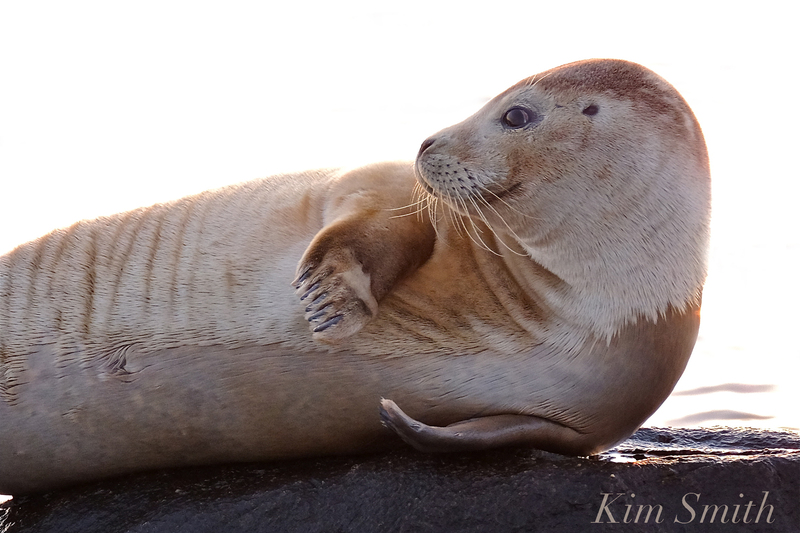 Pups are able to swim within minutes after birth and can travel with the female while she hunts. 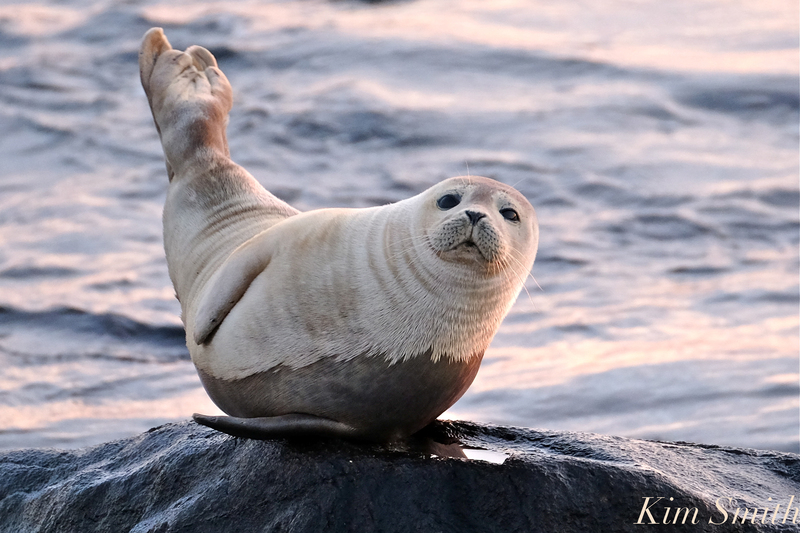 On Stellwagen, small pups are often found treading water while waiting for mom to return from a dive. Adults of both sexes are similar in appearance, with lighter undersides, brown to gray topsides and differing amounts of irregular spots throughout. 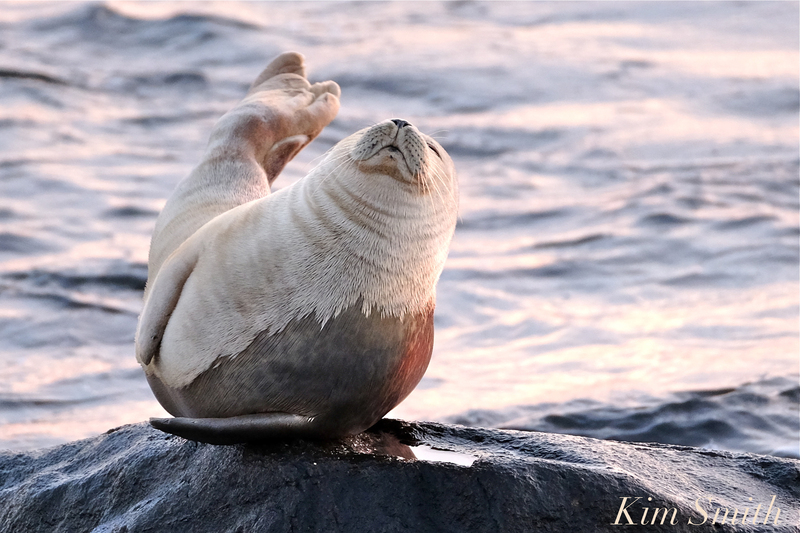 Harbor seals’ front flippers have relatively small claws, and the claws of their hind flippers are tiny. At sea, they can be hard to spot. Only their heads are visible as they come up for air, their snouts are small and pointed, and they have a small but definite brow. If you have binoculars, you can spot ear openings just behind the eyes. 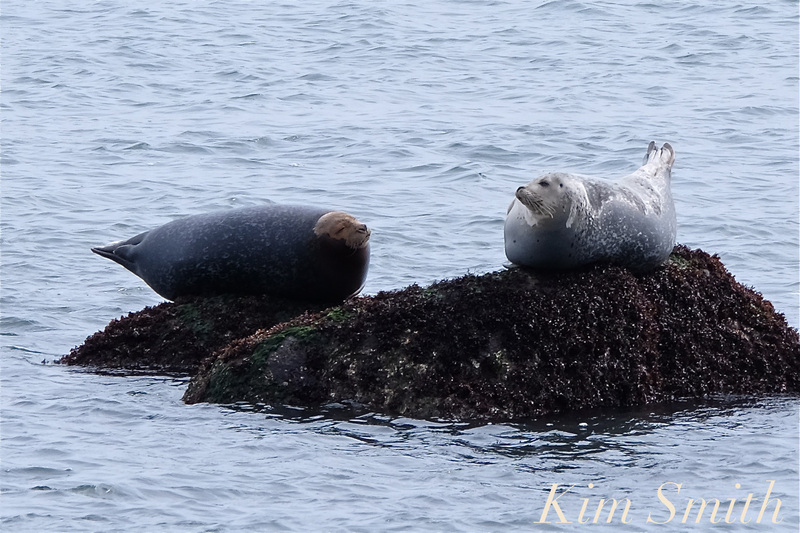 Profiles of male and female gray seals. 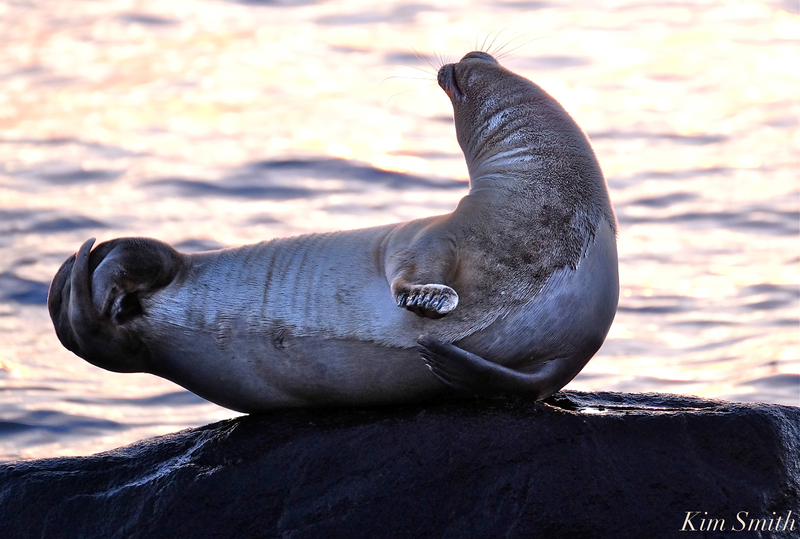 Gray Seals, Halichoerus gypus, are the largest seal found in the area, with males growing to 8 feet and weighing over 900 pounds (2.3 m. and 300-350 kg.). Females are somewhat smaller, measuring 7 feet and weighing less than 600 pounds (2 m. and 150-200 kg.). Besides size, the sexes differ in a number of ways: males tend to be darker with few light spots, while females tend to be light with dark, irregular blotches. 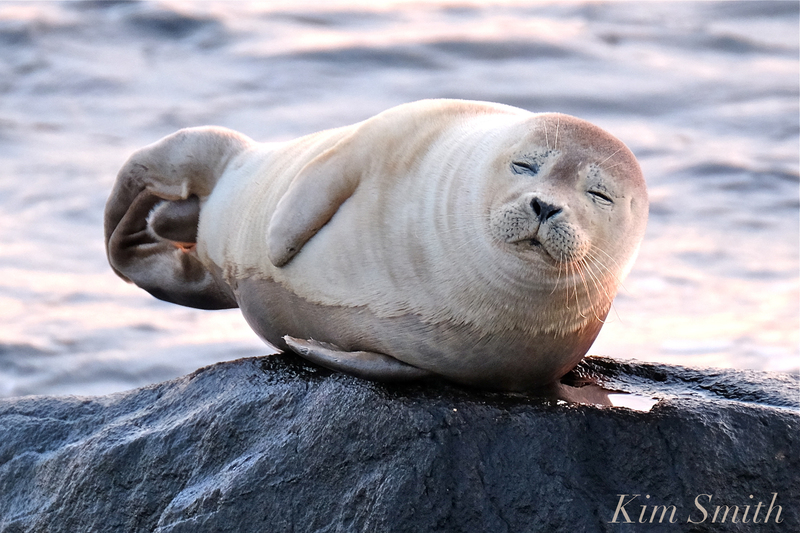 Young can be easily confused with harbor seals. 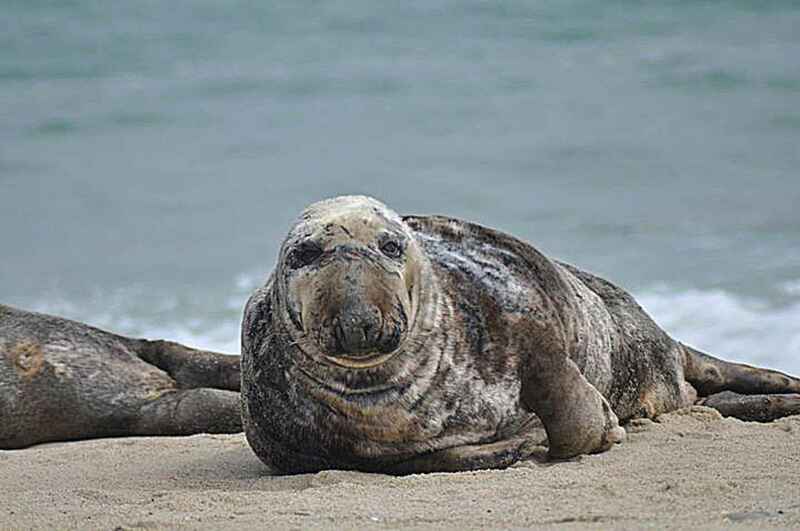 With a head-on view, gray seals have wide-set nostrils that form a W, while harbor seals have close-set nostrils that form a small V. Sometimes called horseheads, gray seals of both sexes have broad, long snouts that become more pronounced, especially in males. 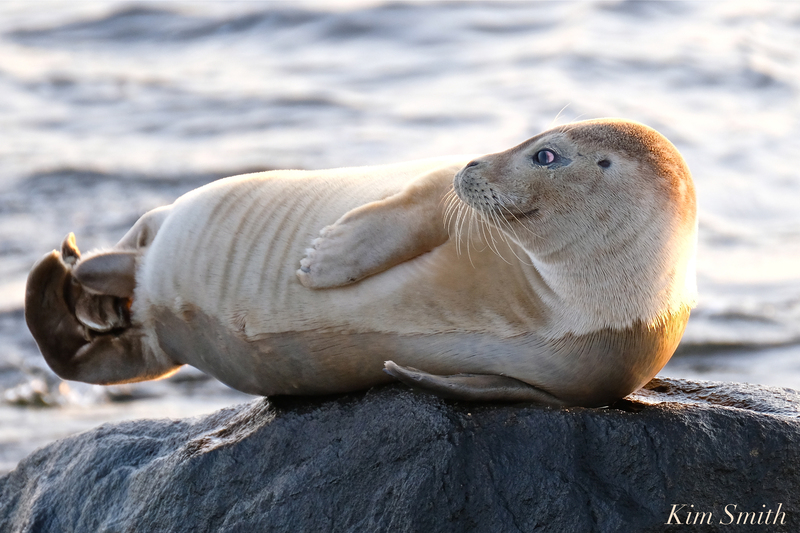 Gray seals are endemic to the North Atlantic, ranging from the Baltic,western Europe to Canada and Northeastern United States. 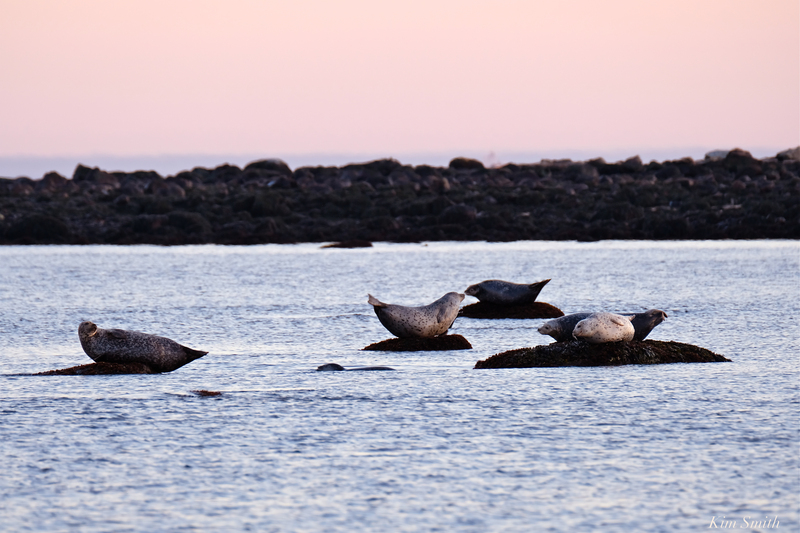 In recent years, the number of gray seals in New England seems to have grown. It is not yet clear if the Canadian population is simply growing and moving south, or if there are other, environmental factors at work. 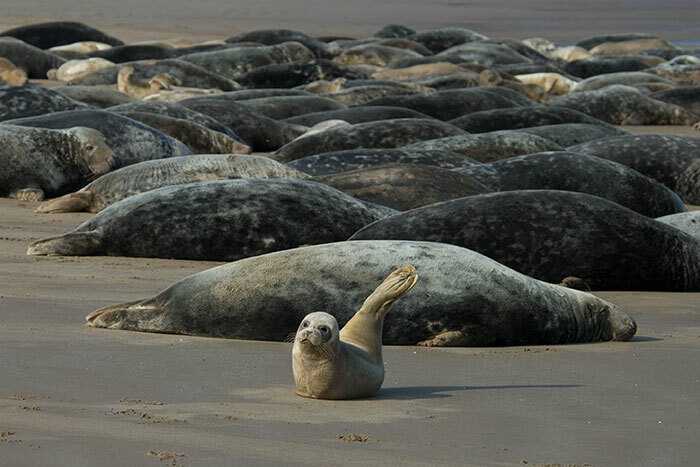 Highly gregarious, gray seals are often found in large groups hauled out on quiet sand or rock beaches for rest and breeding. 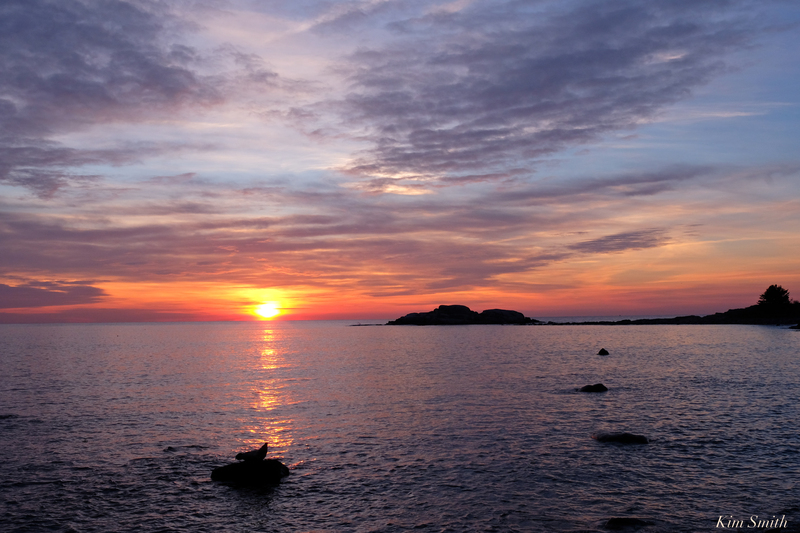 Females in this area, such as Monomoy Island in Nantucket Sound, give birth to one, white-coated pup from late December to mid February. The pup is nursed intensively for about 15 to 20 days on an increasingly fatty milk. Females come into estrus about 2 weeks after weaning their pups. Males are highly competitive over access to groups of females on shore. After fertilization, the embryo stops development and “rests” for 3 to 4 months before development resumes (delayed implantation).